There are over 3000 charities, voluntary and community groups and social enterprises in Manchester doing fantastic work in local communities. Macc, the organisation which supports the voluntary sector in Manchester, has announced a Festival to celebrate the work of thousands of volunteers and paid staff working in organisations all across the city. 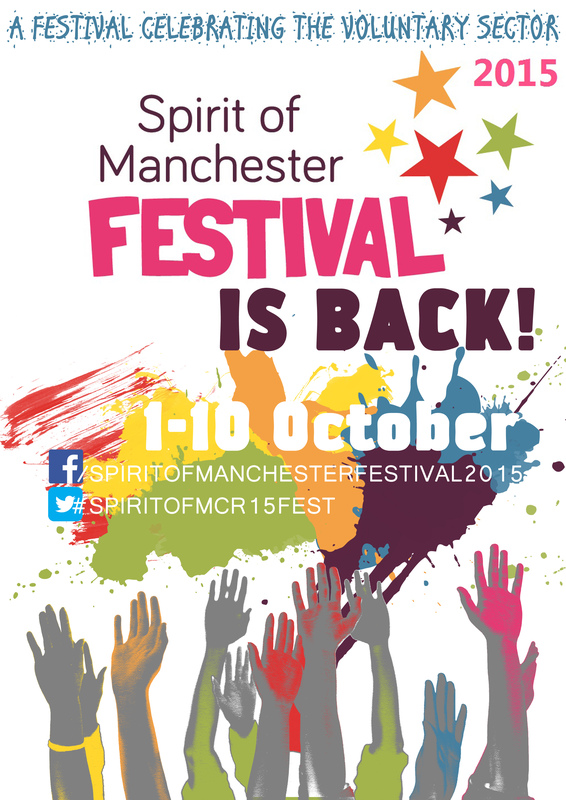 From 1st to 10th October 2015, events will take place all across Manchester. Confirmed so far are well-known local charities such as The Booth Centre which works with homeless people, Manchester’s Lesbian and Gay Chorus and Simply Cycling’s all ability cycling community. These and many other groups will be hosting events of all shapes and sizes. Macc is co-ordinating the Festival and more events are being added to the calendar every day. The 2015 Spirit of Manchester Festival follows on from one in September 2014 which saw over 70 events take place across the city during a single week. “The Spirit of Manchester Festival is a showcase of the fabulous the diversity and vibrancy of communities in Manchester. It is a symbol of what we all love about this amazing city. It is an opportunity for the community and voluntary sector to stand up and shout about just how brilliant it is and the difference we make to life in Manchester. Macc is making an open invitation to the people of Manchester to get involved. Any volunteers, groups, charities and organisations as welcome to put on an event. Local businesses are invited to show their support for good causes in Manchester. And people who live in, work in or just visit Manchester are invited to come and see the great work of the sector that makes this city what it is. Macc is a charity which provides support to Manchester’s voluntary and community sector. The organisation provides support to local groups in finding funds, setting up and developing, working in partnership, campaigning. Macc also runs the Manchester Voluntary Sector Assembly and Volunteer Centre Manchester. Macc’s “State of the Sector” research published in 2013 revealed there are some 3093 voluntary and community sector organisations in the city of Manchester employing 12,400 staff alongside 94,300 volunteers. The centrepiece of the Festival is the Spirit of Manchester Awards celebrating the achievements of voluntary and community groups all across the city.